If you told me on April Fool’s Day 2004 that a simple joke would result in me traveling to Zambia in Southern Africa, I would have said, “The joke’s on you pal”. But sometimes, life takes you down unexpected paths. You see, that was the day International Tom Hanks Day was born. 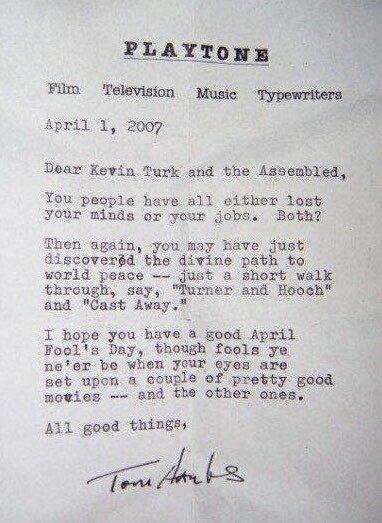 The perfect combination of a college Tom Hanks’s movie marathon and a well-timed April Fool’s joke. Suddenly we’d created something magical. But what to do with this newfound “holiday”? How could we make it significant for years to come? Our annual Tom Hanks parties just weren’t sustainable for a handful of college students about to go their separate ways. But then, in the spring of 2007, a letter arrived. And it changed everything. Shortly thereafter, many other things arrived, like posters, DVDs, movie props (Wilson!) – all signed by Tom Hanks! The way forward was now clear, but we had to tie it all together… and that’s when we found Lifeline Energy, Tom’s favorite charity, and one for which he is the US Ambassador. 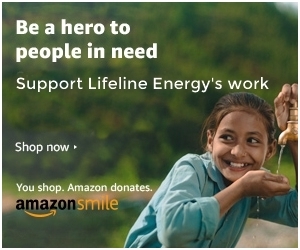 We quickly to raffled the signed items off to attendees, and donated all proceeds to Lifeline Energy. And that’s what we have continued to do every April since. The venues and number of satellite events have grown over the years, but the meaning of Tom Hanks Day has remained the same: Have fun and do good, all in the name of Hanx. 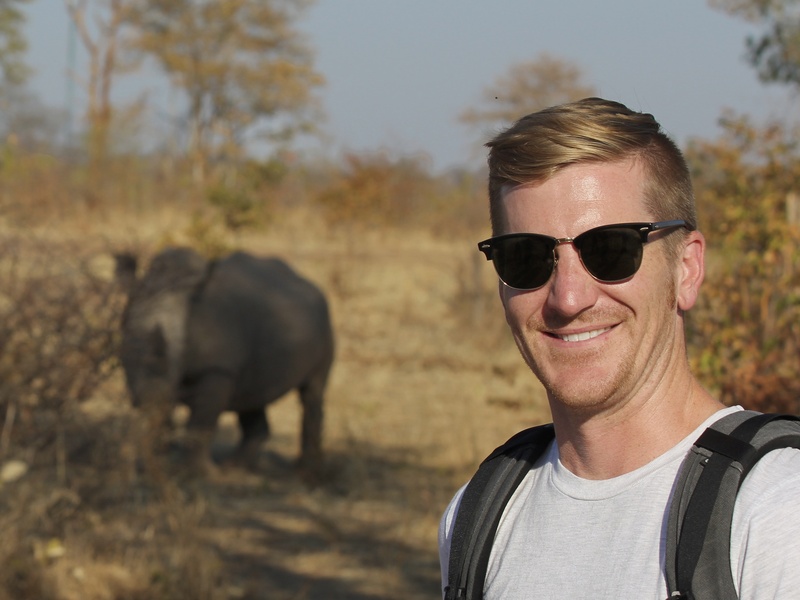 Tom Hanks Day co-founders Kellen Manley and Kevin Turk in Zambia. Flash forward to August 11, 2016, a day over 14 years in the making. 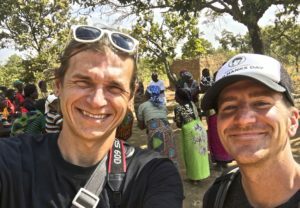 It was the day THD co-founder Kellen Manley and I traveled to Zambia to spend 10 days with Kristine Pearson, Lifeline’s CEO. We wanted to see the impact of their work, as our only contact over the years were late night/early morning Skype calls. But it felt like family the second we met Kristine and began our adventure across Zambia. We started in the south at one of the natural wonders of the world, Victoria Falls, and ended in the Eastern Province near Malawi. Along the way we met incredibly inspiring individuals – a mother focused on educating others on the importance of good nutrition; a teacher who was one of the first to ever use a Lifeline radio in his over-crowded classroom, and farmers revolutionizing the farming systems in Zambia from the ground up. Each person we met was committed to bettering themselves and those around them. All different, but with one common denominator; they knew and understood the value of Lifeline Energy and their self-powering radios. These radios were used as a vehicle to disseminate educational content to groups where there was no electricity. People couldn’t even afford the cost of batteries. When you’re poor, they’re expensive. We travelled to different villages and sat in on radio listening groups. Women farmers would gather around a big, blue Lifeline Prime radio and listen to weekly Farm Talk shows. They not only listened to the content, they then discussed the best ways to implement what they learned into their community. I struck me as just how powerful this information is to a farmer. It can be mean the difference between a great harvest and not being able to feed your children. There are countless things I could say about Lifeline Energy, but action is the place from which I am speaking now. Taking action and working towards a world where everyone has access to information is the only way forward. So to everyone that has supported Tom Hanks Day and therefore, Lifeline Energy, over the years, T.Hanks for all that you have done. I feel more committed to Lifeline than ever before and that’s saying a lot for a college dreamer.